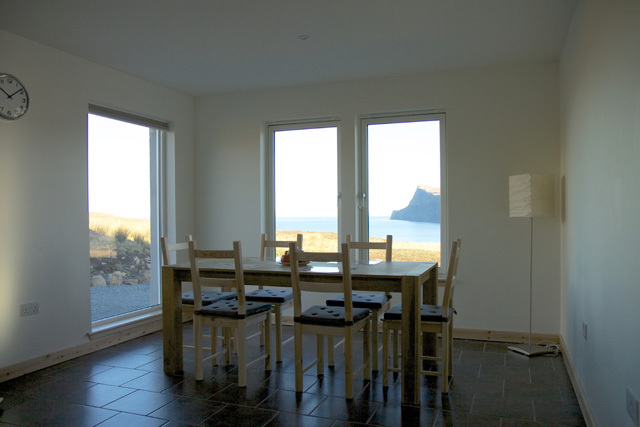 Pooltiel House is a recently completed property ideally located for enjoying the north west corner of the island. 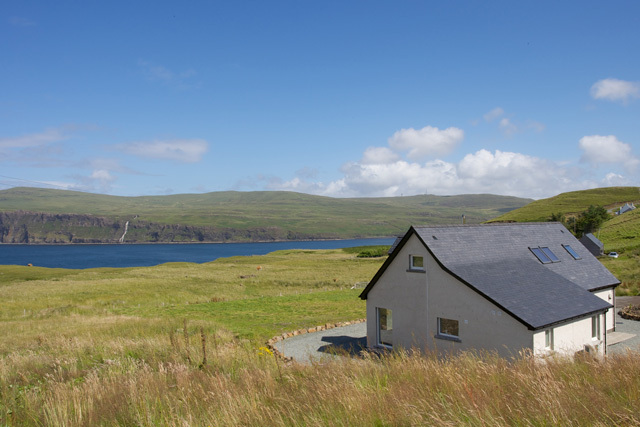 The house enjoys fantastic views over Loch Pooltiel to Dunvegan Head, and towards The Little Minch and the Outer Hebrides. 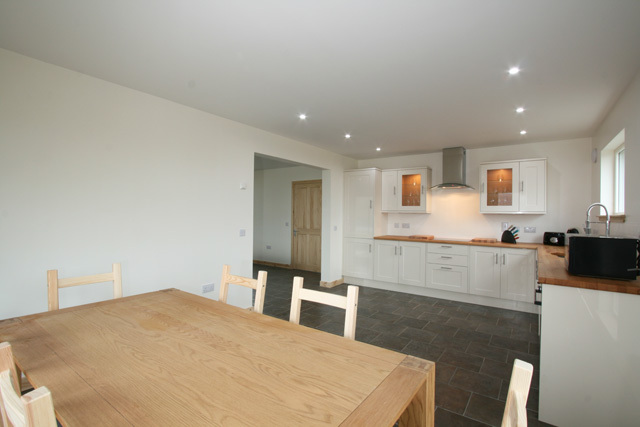 The property offers spacious modern accommodation, which makes it ideal for a family. The accommodation is on two levels, and throughout the property has been tastefully furnished and equipped to a high standard. On the lower level all the floors are tiled and benefit from under floor heating. 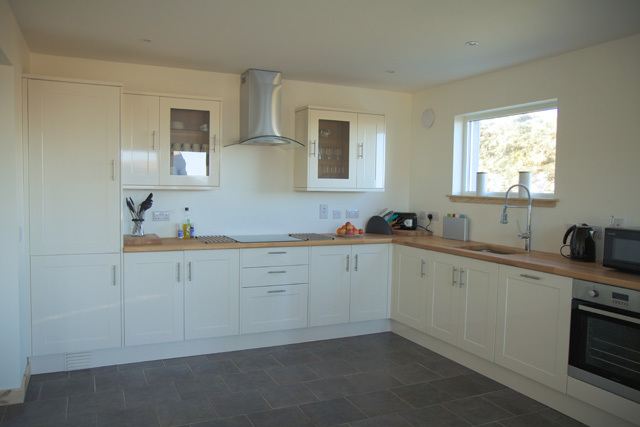 The main living and kitchen areas are open plan and ideally positioned to enjoy the views. The lounge has beautiful leather sofas and a wood burner, and this room offers direct access to the garden. The kitchen is well appointed with all the usual appliances and has a dining table and seating for six, and again enjoys some magnificent views. 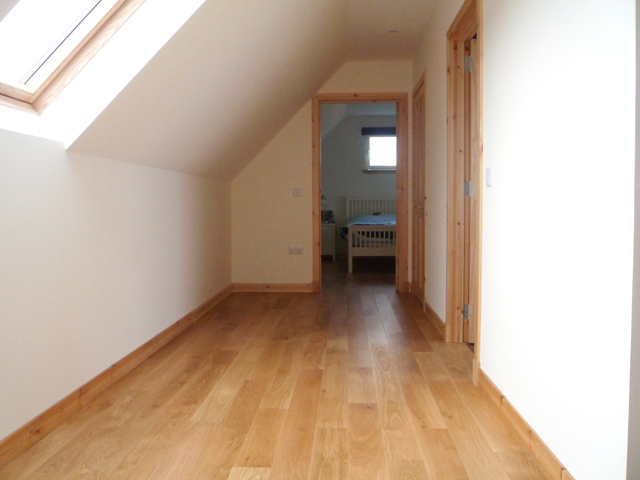 A twin bedroom with an en-suite shower room is located on this level, as is a utility room and a cloakroom. From the lounge, stairs lead to the upper level, where two bedrooms; a master with a super king bed and a twin, can be found. 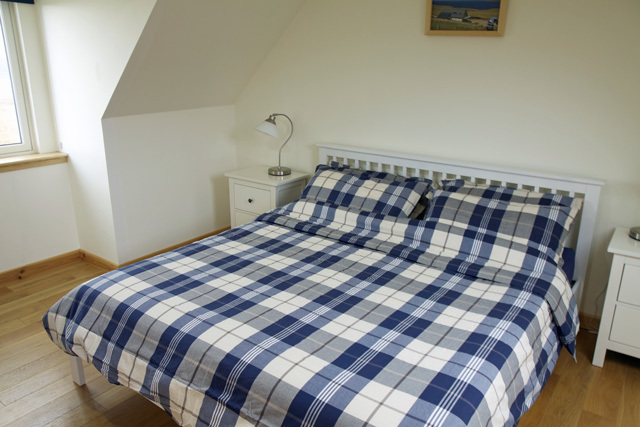 The bedrooms are spacious and benefit from uninterrupted views to Loch Pooltiel and Dunvegan Head. A large shower room completes the facilities on this level. Throughout the upper level beautiful wooden flooring has been used which adds to the character and the ambience of the property. Outside an enclosed garden offers the perfect place to sit and relax after a day exploring. The area offers much choice for the visitor by way of attractions and days out. The small village of Glendale is located just ten minutes drive away, and offers a small shop and a couple of seasonal cafes. The property is close to Neist Point, the scenery here is quite spectacular and a walk down to the lighthouse is highly recommended. 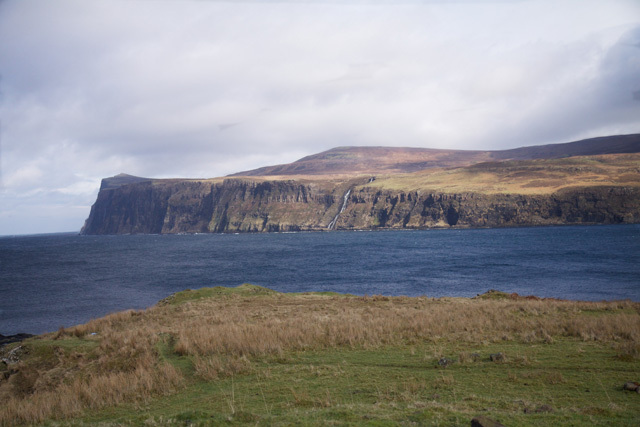 The area is home to a large population of seabirds and the point is regarded as the best place on Skye to see whales, dolphins, porpoises and basking shark. The small town of Dunvegan offers a good range of facilities for the visitor including a few shops, the Old School Restaurant, a tourist information centre, and on the outskirts Dunvegan Castle can be found. The castle is the ancestral home of the Chief to the Clan Macleod, and sits in a commanding position overlooking the loch, it is open to the public during the months of April through to mid October, and tours are available. A few miles from the castle the coral beach at Claigan is well worth a visit and makes a relaxing choice for a day out. Tiled flooring with underfloor heating throughout the ground floor. 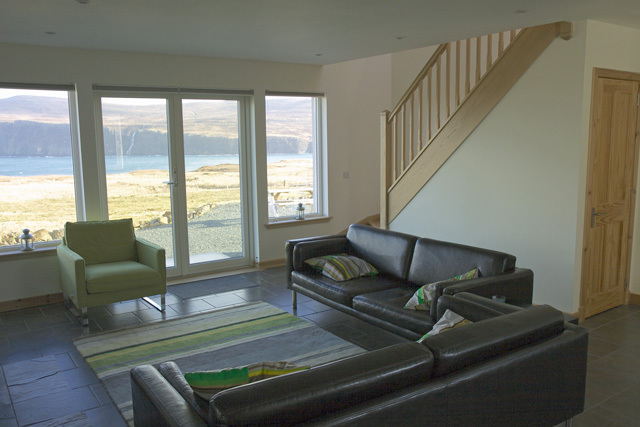 The open plan lounge has wonderful views over Loch Pooltiel to Dunvegan Head and beyond. Comfortable leather sofas, wood burning stove, Freesat TV, DVD with blu-ray, radio and iPod docking station. Spacious and bright kitchen diner, electric oven and hob, dishwasher, fridge/freezer, microwave, dining table with seating for six. Utility room with washer/dryer, ironing facilities and drying area. Cloakroom, wc, whb, heated towel rail. Twin bedroom with en suite, shower, wc, whb. Bathroom with shower, wc, whb, heated towel rail. 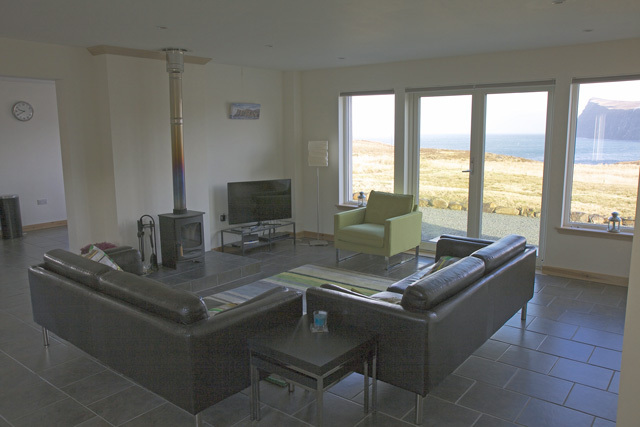 All the upstairs rooms have uninterupted views to Dunvegan Head, Loch Pooliel, The Little Minch and the Outer Hebrides. Electricity, air source heating, and initial supply of logs for the wood burning stove. WiFi internet access, bring your own laptop, please note that due to the location of the property the service is subject to conditions, availability and limitations set by BT. Ramp access and tiled floors thoughout the ground floor. Downstairs twin bedroom with en-suite shower, whb and wc. Beautiful spacious property ideal for a family. Tastefully furnished and equipped to a high standard. Quiet location with village amenities just a short drive away. 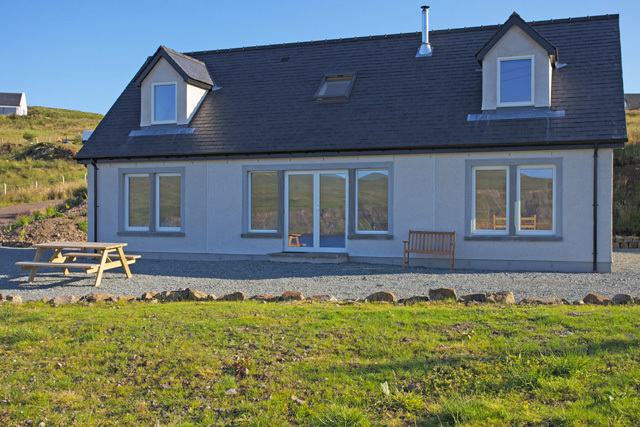 An excellent holiday home in an ideal situation with wonderful views. The accommodation far exceeded our expectations - a large lounge with ample seating for 6 people, spacious kitchen fitted with modern appliances and seating for 6, shower rooms and three good sized bedrooms. We did have a problem with the supply of hot water and underfloor heating but both were corrected in quick time; the supply of hot water very quickly and the heating far quicker than we anticipated since an engineer had to travel from Inverness in inclement weather conditions - 40 mph gales with rain, hail & snow . A sincere thank you to all concerned. These problems served to emphasise the "house insulation" is excellent!! During our week we visited the Coral Beach north of Dunvegan, the Dinosaur Beach at Staffin and the Quiraing on our way from Staffin to Uig, the Fairy Glen and Golden Cave above Uig, and Neist Point lighthouse. At the farm (Kelpie crafts) near the lighthouse we stopped to see the lambing. Linda, the farmer, encouraged our grandchildren to bottle feed the friendly lambs and showed us her large amount of craft work housed next door - a visit is a must. We managed a wet weather walk to the Fairy Pools on our way home - a good walk but not for the faint-hearted in bad weather conditions. At least the pools were full and this elderly couple had our children and active grandchildren to ferry us across the wide streams and over the large spacious stepping stones - an exciting visit! Overall - an excellent week (the weather wasn't too bad!) which we would like to experience again in the near future - in Pooltiel House Thank you. Pooltiel House is an immaculate and well equipped holiday home. Fabulous views and great walking straight from the door. The porch / utility area is perfect for muddy boots and as the boiler is located there, this is always really warm so good for drying of damp coats (much needed in Skye). if you're looking for a totally relaxing holiday in a beautiful setting in first class accommodation Pooltiel House fits the description.The cottage is a pleasure to stay in with all the features and home comforts you could ask for,clean and spacious and an amazing sea view. Perfect cottage, with everything provided to make our stay as pleasant as possible. We had a wonderful time. Wilderness cottage staff was friendly and helpful. Probably one of the best cottages I have ever stayed in! The view is unsurpassed, with ever changing light. 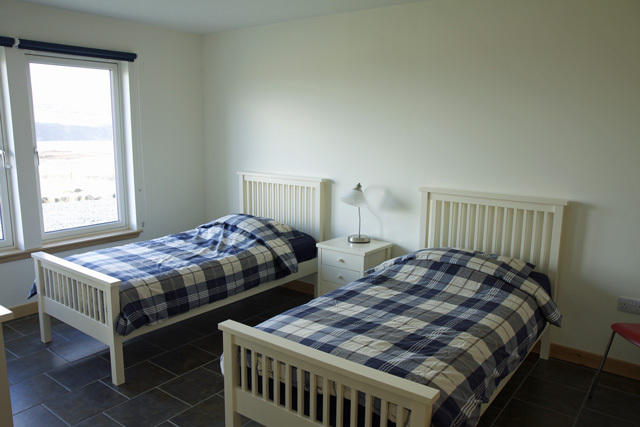 The cottage is large, new, fully equipped, very comfortable, and well kept. A roomy house with a wonderful view in a superb location. We saw sea eagles most days and if like us you go to Skye regularly, so are not doing the Skye tour, there are so many local walks to do - you don't need to get into your car much after the long journey to get there. We immediately felt at home and comfortable at Pooltiel House. It was clean and fresh on arrival and welcoming. We appreciated the space, the open view and the layout. 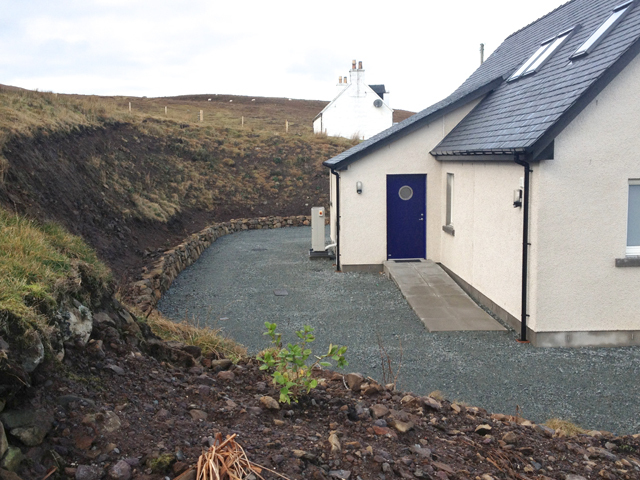 Our week's stay was very successful and we loved this corner of Skye. It would have been helpful to have more cooking and microwave dishes but otherwise the property is very well equipped, including maps, etc. We particularly appreciated the owner supplying garden furniture, although the weather meant our use of it was limited! 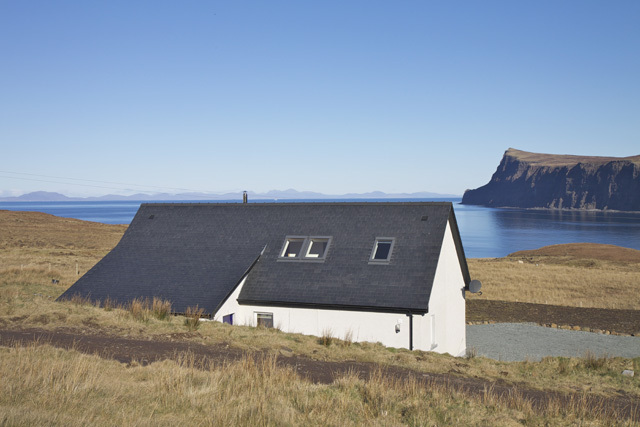 A wonderful well equipped house with a fantastic view. A couple of little gifts on the table on arrival was a welcoming touch.We spent a very comfortable fortnight and would be very happy to return. Skye is an amazing island thank you.